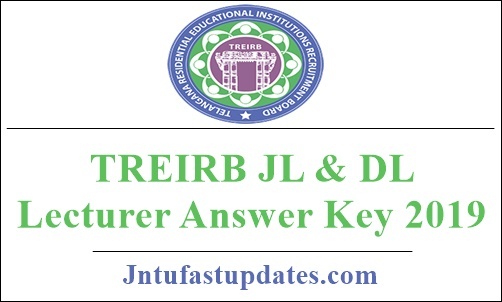 TREIRB Lecturer JL and DL Answer Key 2019: Telangana Residential Educational Institutions Recruitment Board (TREIRB) has recently organized the Degree College Lecturer and Junior College Lecturer exams in the month of February. The organization conducted the JL and DL exams from 14th February to 20th February in many examination centers across the state of Telangana. Candidates aspiring to become lecturers in Gurukulam colleges of Telangana have actively participated in the written test round. Hopefuls can have the opportunity to download TREIRB JL & DL Answer Key 2019 from the official portal, treirb.telangana.gov.in. The answer sheet will be accessible to download in PDF format. Aspirants can simply download it by just tapping on the provided link. The TS Gurukulam Lecturer answer key 2019 PDF will contain all sets A, B, C, and D. Candidates can compare the answers with their attempted set and estimate the probable score by tallying with the questions & answers given in PDF file. Hence by, the candidates can get the knowledge of their attempt, and the probable score that is going to be obtained in the test. Telangana Residential Educational Institutions Recruitment Board (TREIB) or TS Gurukulam is the state level educational organization that offers jobs in residential schools and colleges. Annually the TREIB department announces various teacher/lecturer notifications to hire the suitable aspirants into various posts. The TS Gurukulam has recently released a notification for 847 Degree Lecturer and Junior Lecturer posts. For TREIRB JL and DL posts, many of the hopefuls have applied from 8th September to 9th October 2018. The organization received thousands of applications from suitable aspirants during the application dates. While the selection will be based on the screening test and interview rounds. Aspirants finally cleared the selection process will get the jobs as a junior lecturer in TS Gurukulam colleges. All the competitors appeared for Telangana Gurukulam Degree Lecturer and Junior Lecturer written test can download the answer sheet from the TREIRB website, treirb.org or treirb.telangana.gov.in. The answer key/question paper solutions will be available within a span of 3 to 4 days after the examination. The TS Gurukulam will upload the answer sheet on its portal. Candidates can download and compare with the answer key to evaluate the score. By analyzing the attempt, candidates can have an estimate about their probable score that is going to be obtained in the examination, the possibility of getting qualified in the written test round, and many other details. Candidates can download TREIRB JL and DL Answer keys paper-wise and subject-wise. The answer keys for paper 1, 2, and 3 for all subjects will be uploaded by the organization shortly. Keep visiting TS Gurukulam Portal to download TS Gurukulam Lecturer question paper solutions. Visit TREIRB website, org OR treirb.telangana.gov.in initially and the homepage will be displayed. Search for Degree Lecturer and Junior Lecturer answer keys link in latest notifications section. Click on the link and provide the required details like registration number etc in specified places. Select the Paper attempted, and Subject. Now, tap on the ‘download/submit’ button. The answer key will be downloaded on the screen in a PDF format. Check the answers with the corresponding set for which you have given the exam.